At 4,547 feet (1,386 meters) tall, the mountain plateau of Pfingstegg is one of the best spots in the Swiss Alps to find a dramatic alpine view. 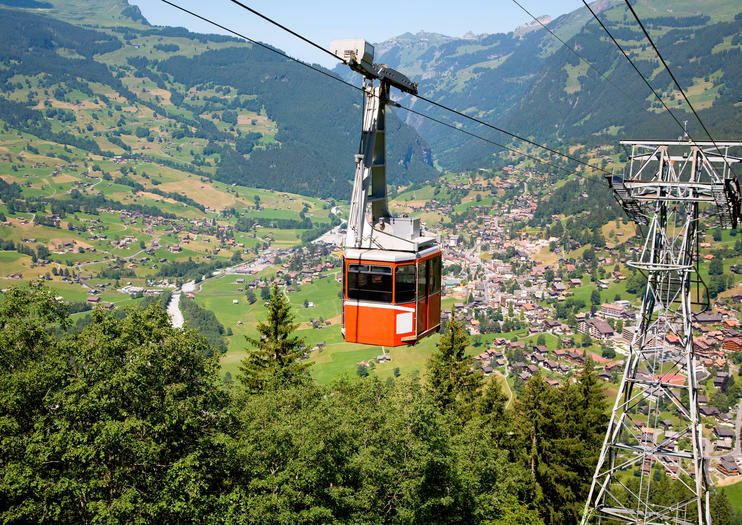 The area boasts Grindelwald's only aerial cable car, and from the mountaintop vantage point, the panorama spans the rolling meadows and glacial peaks of the Grindelwald valley. Pre-booking tickets for the Alp Pfingstegg cable car means you can skip the lines and hop straight aboard for the thrilling 5-minute ride through the Alps. For an even more memorable experience, book a table at the site's mountaintop restaurant and enjoy a candlelight dinner, gazing out over the Grindelwald glacier below. It can get chilly on the mountaintop even in summer, so bring a jacket in addition to sunscreen, comfortable shoes, and your camera. The Pfingstegg cable car is wheelchair accessible. Pfingstegg is located above the Grindelwald Valley in the Bernese Oberland and is reachable by cable car from Grindelwald village. The cable car station is about a 10-minute walk from Grindelwald train station. The cable car and mountain attractions are open from May to October. Cable cars run more frequently between June and September, but for fewer crowds, visit out of season or plan for an early morning arrival. After taking in the spectacular views, hop on the summer toboggan run, reaching speeds of up to 25 miles per hour (40 kilometers per hour), or rent an electric bike and zip down the mountainside. The Pfingstegg is also a strategic starting point for hikers, with trails leading down into the valley and up through the surrounding mountains.